Ashton – Drake Galleries first introduced its incredibly popular “Gene” doll in 1995. 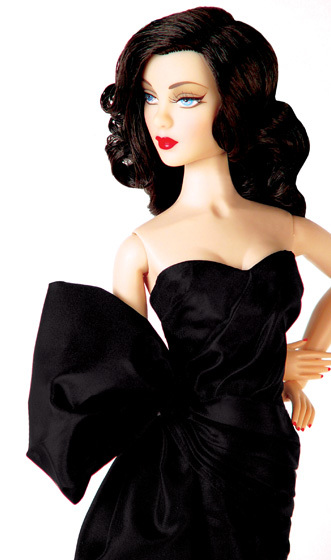 Gene Marshall is a 15 1/2″ vinyl fashion doll, inspired by all the legendary screen goddesses of Hollywood’s Golden Age, the ’40s and ’50s. She is designed by award-winning New York artist Mel Odom. With her sultry face and knowing blue eyes, Gene has an air of sophistication that tells you that this woman has seen the world. Pictured right is Manhattan Holiday. Manhattan Holiday is a knock-your-heels-off-gorgeous cocktail dress of “tortured black taffeta,” with an elaborate side pouf and floor-length sash. The sweetheart neckline blouse is topped by a short, fire engine red jacket with mandarin collar, beaded in black and tapered to vest points. Gene’s shoes are sleek black pumps with red corded soles, polished to a high sheen..
A large part of Gene’s appeal is nostalgia. Her fabulous wardrobe, with designs reminiscent of the ’40’s, remind one of Joan Crawford or Ingrid Bergman. This is clearly a doll for adults. The line has been expanded to include some period furniture, and Vogue has also issued vintage sewing patterns. Values have risen sharply on the secondary market. Since 2006 the dolls have been produced by Jason Wu and made by Integrity Toys. They have a dedicated following and have inspired other characters in the line: Madra Lord, Violet Waters, Ivy Jordan and Trent Osborn.